This is supposed to shut me up, because it’s Ben Franklin speaking. Why should it? Franklin was a mere mortal, and his arguments are only as strong as the logic behind them. 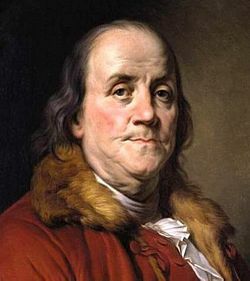 There are quite a few problems with Franklin’s argument — which is actually more assertion than argument — but a key issue is the distinction between property that is “necessary to a man, for the conservation of the individual and the propagation of the species” on the one hand, and property that is merely “superfluous” on the other. How does Franklin propose to make that distinction? Economist George Stigler noted decades ago that in order to meet the nutritional standards of the U.S. government in 1943 least expensively, a man of 154 pounds could consume, in a year, 370 pounds of wheat flour, 57 cans of evaporated milk, 111 pounds of cabbage, 23 pounds of spinach, and 285 pounds of dried navy beans. Is that all I’d be allowed under the Franklin scheme? Strictly speaking, all else is “superfluous,” right? Yet Franklin leaves no record of having been quite so abstemious himself. How about theater tickets? Are those “superfluous”? If not, how many theater tickets would Ben Franklin consider essential for a satisfying life? You see how arbitrary and inane this becomes. Also, who’s going to decide what part of my property is necessary (and therefore all right for me to keep) and what part is “superfluous”? Government, of course — the very institution that will be able to grab the allegedly superfluous part for itself. Seems like the institution charged with making the decision about my property might — might, I say — have a vested interest in the outcome. This is mere assertion on Franklin’s part, and it falls prey to the arguments I made in my “When Did I Sign This Social Contract?” video.